Do you have dishes that you don't like because you had too many bad versions of it during your childhood? In my case, pasta salads fall into this category. Pasta overcooked, drowned in some mayonnaise-based dressing and badly or not seasoned at all. This is what comes to my mind, when I think of pasta salads. My experience with pasta salads is vast, as they are a staple at German summer BBQs (competing with mayonnaise-drowned, under-seasoned potato salads). 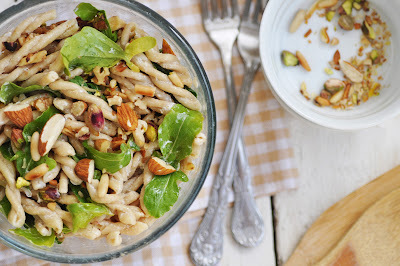 As a result, whenever I saw pasta salads on a menu, I was immediately looking for other things that would tickle my fancy Until I came across this Nutty Green Pasta Salad. I must admit, I have had some sort of carb craving in the last few days (which I partly satisfied with bad carbs... I am not only eating the stuff that I am posting here... just to make that clear). But I was particularly craving a pasta salad. So I paged through my cookbooks, and found this overtly simple, but utterly delicious pasta salad in a German cookbook, written by Tim Mälzer (the German equivalent to British Jamie Oliver). 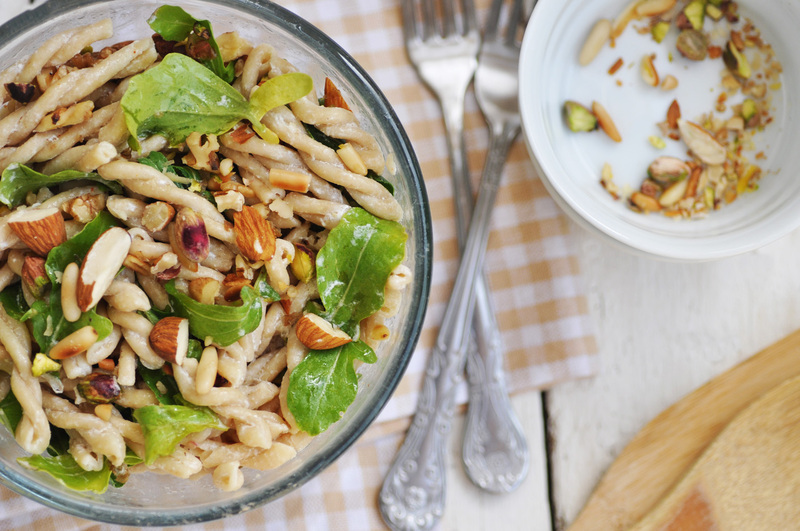 The ingredients list could not be more simple: pasta, a variety of nuts and arugula. The latter I grew in my garden over the winter here in Dubai. Today I picked the very last leaves that managed to resist the 44C/111F that we had this afternoon. I Stuck the salad in the fridge for a couple of hours, did some work and pulled out the most refreshing pasta salad out for my lunch. This salad could become a staple in my house. I love the crunch of the nuts in combination with the al dente pasta. The arugula adds some bitterness to it, which again goes well with the sweet earthiness of the nuts. A no-guilt pasta salad for any carb craving stages in your life, or the BBQ next weekend. In the meantime, wash and dry arugula laves. Place nuts in a dry pan, and roast for 4-5 minutes on low heat, tossing them a few times to avoid burning. Take off the heat, let cool, then roughly chop. Set aside. In a small bowl, combine all dressing ingredients. Season with salt and pepper according to taste. Drain the pasta when cooked. Transfer to serving bowl. Stir in arugula leaves and dressing. Top with roasted chopped nuts. Once the salad has cooled completely, cover and keep in the fridge until serving.